Oh my gosh – nutrition and diet information – is everywhere! And each “expert” tries to lead you in their direction because they know best and their advice is going to help you. Right? And we seem to be accepting of self-proclaimed gurus, who dispense such advice. Everyone has heard (and maybe lived through) the intense focus on how much you eat. The calorie narrative has been beaten into our psyche, and we accept it without a second thought. 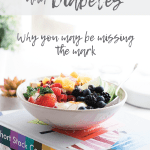 While how much you eat does affect blood sugars, weight, and energy level – it’s certainly not the “holy grail” of health and effective diabetes management. The “calories in, calories out” philosophy (i.e. how much you eat) is being drowned out with research on other factors that may be just as important. Don’t get me wrong, limiting calories, carbohydrates (to control blood sugars) or fat can certainly help you lose weight but that’s simply not the only factor for long-term weight loss and maximum energy . I do, however, support calorie labelling as a tool to help people make informed decisions – the amount and type of calories matter. Ideally, you need a varied diet full of minimally-processed foods (i.e. fewer “packaged” “ready-to-eat” foods). This simple concept is paramount for diabetes and weight management, energy, and overall health and wellness. A rainbow of fruits and vegetables: A colourful array of vegetables at almost every meal and ideally at snack time. Focus more on non-starchy vegetables such as, leafy greens, asparagus, broccoli, carrots, beets, beans, and peppers. Believe it or not, the opinion that fruits are forbidden for those with diabetes is a myth. Like vegetables, whole fruits offer important nutrients; you need the fiber, antioxidants, vitamins, and minerals. A small piece of fruit has about 15 grams of carbohydrates, as does a three-quarter to 1 cup serving of fresh berries or melon. The Harvard-based Nurses Health study provides compelling evidence that a diet rich in fruits and vegetables can reduce the risk of cardiovascular disease – a leading risk for those with diabetes. More plant-based sources of protein. 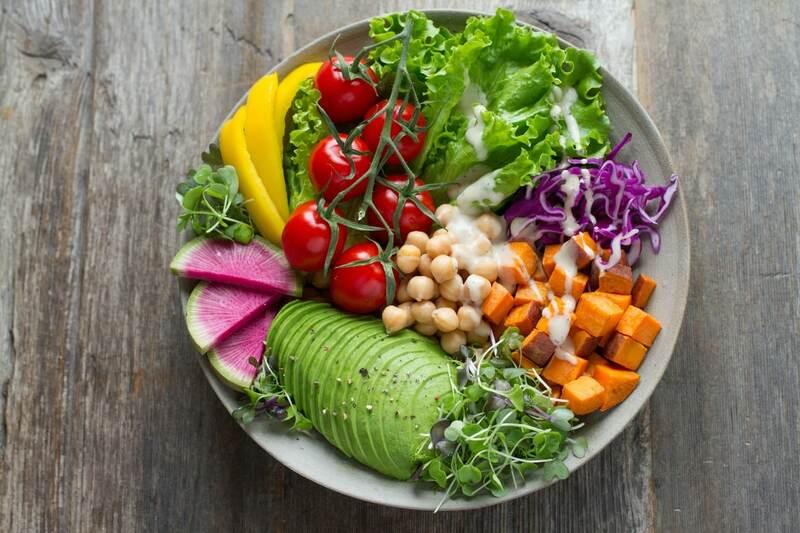 Adopting a predominantly plant-based diet, such as the Mediterranean diet, is widely regarded to be an effective strategy for the management of diabetes. A mediterranean-style eating pattern has been shown to improve blood sugar control, reduce cardiovascular risk factors, such as blood pressure and cholesterol levels in type 2 diabetes. Protein-rich foods can help to keep you fuller for longer and because protein is absorbed less efficiently than carbohydrate, its effect on blood sugar levels is considerably less. Healthy fats and oils (avoid “hydrogenated” ones). There is a reason some fatty acids are called “essential” – you need them as building blocks for your hormones and brain as well as to be able to absorb essential fat-soluble vitamins from your uber-healthy salads. Limit saturated fat in your diet (butter, red meat) and include extra virgin olive oil, nuts, seeds and avocado as sources of high quality fats. And if you’re on the Keto Diet bandwagon, I strongly suggest you listen to my video. Hearty whole grains. Being one of the main sources of carbohydrates, whole grains are often the most neglected food group for those with diabetes – in fear that their consumption will impact diabetes management adversely. Whole grains, in fact, are a smart choice because they are low GI, rich in fiber and a prominent feature of diets of the healthiest people in the world – the Blue Zones communities. Studies indicate that whole grain foods, such as oats, rye, brown rice, wholegrain bread, and quinoa may be more satisfying than their refined counterparts, which may help to keep blood sugars in check. How you eat and drink matters. Studies are indicating that this has more of an impact than we previously thought. When it comes to how you eat, let’s first look at “mindful eating”. Mindful eating can help to promote more healthful eating behaviours. Simply put, it means to take smaller bites, eat slowly, chew thoroughly, and savour every bite. Notice and appreciate the smell, taste and texture. Breathe. Mindful eating helps to give your digestive system the hint to prepare for digestion and to secrete necessary enzymes. Eating with attention and intention also addresses the role of hunger and satiety cues and stresses eating in response to those cues instead of eating in response to automatic patterns. This can also help with weight loss because eating slower often means eating less. Did you know that it takes about 20 minutes for your brain to know that your stomach is full? According to Diabetes Spectrum, from the American Diabetes Association, the impact of mindfulness based approaches on A1C has been mixed; with some studies reporting a powerful reduction and others reporting no significant change in A1C. In general, improvements have been noted in weight and abdominal fat. And what about about drinking your food? Yes, smoothies can be nourishing and a fabulously easy and tasty way to get in some fruits and vegetables (hello leafy greens!) but drinking copious amounts of food may contribute to erratic blood sugar levels, issues with weight and feeling sluggish. However, if these are planned well, smoothies can be part and parcel of a healthy and balanced diet for those with diabetes. Add more leafy greens – the darker the better. Spinach, Romaine lettuce, kale, beet greens, collards and arugula all work well. Fresh herbs are also a great way to bring flavour, colour and added nutrition to smoothies. Include berries. These are low in glycemic index (cause a lower and slower rise in blood glucose and, therefore usually, insulin levels) and offer a boost of vitamins, minerals and antioxidants – with natural sweetness. Go nuts. A handful of almonds, walnuts, pecans or pistachios will not only boost the protein content of your smoothies, but will offer a dose of healthy fats and fibre – all to help you stay fuller for longer. Adding a spoonful of flax or chia seeds also works like a charm. Choose H2O or milk. Water offers a calorie-free, sugar-free liquid option for your smoothies. And if you prefer a creamier texture, milk is the way to go. Unsweetened plant-based milks, such as almond, soy, flax, coconut, hemp, and cashew milk and low carb liquids that offer anywhere from 1 – 4 g of carbohydrate per cup (8 oz). 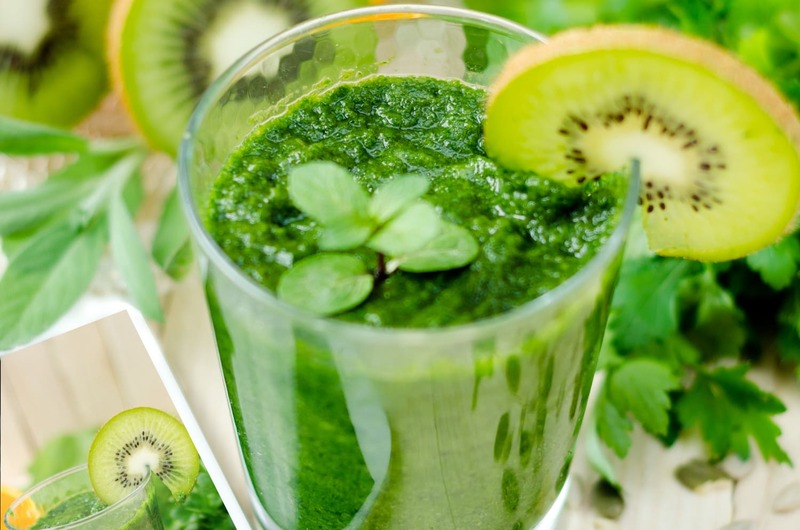 Remember, a green smoothie can make an amazingly nutrient-dense meal and is way better than stopping for convenient junk food – just consider a large smoothie to be a full meal not a snack. And don’t gulp it down too fast. Shake up your breakfast game with this vegan energy-packed Chia Peach Green Smoothie. A beautiful blend of sweet fruits and fresh green spinach to create a tasty and satisfying recipe. You can use almost any fruit in this smoothie, it’s a great way to use up leftovers. A frozen banana makes a big difference to the texture. It adds creaminess and thickens the smoothie almost ice-cream like and also helps keep it cool. I used unsweetened almond milk to avoid added sugar.